ARTErra is a multidisciplinary artistic residency placed in the green and friendly village of Lobão da Beira. We began our project with the aim of hosting artists by providing them with accommodations, workplace and cultural and ideas exchanges with the community and other artists. The studios--surrounded by a big garden, a small animal yard and an orchard--are spacious and bright spaces perfect to do some research and develop your project in a very relax and comfy environment. We have a workroom in the main square of the village where small exhibitions, talks and performances can be presented. This is the perfect place to "try out" and show your work. During the years we have built a strong relationship with the people of Lobão da Beira who are open and curious about ARTErra artists' works and are willing to participate in our ongoing projects. We accept application from artists who work in all disciplines and at any stage of their career. Please check our website or social media for more information about our project. 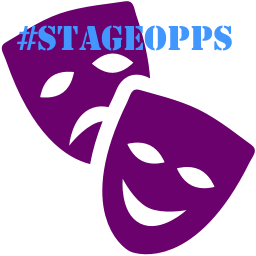 The application deadline has been extended to May 31 for #StageOpps subscribers. Just email email specialoppscode@gmail.com to get the special code for this month’s Special Opportunity! Eligibility: Playwrights must be from Metro New York area. Plays must be under 10 minutes and have an LGBTQ theme. Plays are to be read script in hand, minimally staged with no props; actors must stand. You must produce the reading of your own play including casting and a minimum of 2 hours rehearsal. Contact: villageplaywrights@gmail.com or call (614) 285-2515. Weathervane Playhouse celebrates the art of the short-format play with the sixth annual 8x10 TheatreFest. Eight plays, 10 minutes each! Each of the eight Finalists will receive a full production of his/her play(s), complimentary tickets to the Festival, and is guaranteed a cash award of at least $50. The top three, as voted by the audience, will receive $350 (1st), $250 (2nd), or $150 (3rd). Eligibility: Each play must include the 2016 prop, an envelope of cash. Cast maximum is three (any gender). No characters under the age of sixteen. Technical requirements must be minimal. No one-person plays, no musicals, or children’s plays. Playwrights must be at least 18 years old. Submitted plays must be un-produced and un-performed outside of readings, workshops, and festivals. Eligibility: Playwrights must currently reside or work in Maryland or D.C. or have previously maintained their primary domicile, or place of employment, within Maryland or DC. Contact: The Librarian at librarian@baltplayfest.org. Playhouse on the Square, now in its 47th Season, is accepting scripts for the 4th Annual "NewWorks@TheWorks" Competition. A panel of local directors, actors, and designers will review all submitted scripts and select six to receive staged readings during the 2016 - 17 season. After the six readings have been presented, Playhouse on the Square will select two that will receive full productions during the 2017 - 18 Season. These two new works will receive world premieres at Playhouse on the Square's third performance space, TheatreWorks. Along with these fully mounted productions, the two winning works will each be awarded a prize of $750. Eligibility: Submissions that have been previously produced or published will not be accepted. A play that is scheduled for a professional production at the time of submission will also not be accepted. Address: Playhouse on the Square, New Works Competition, 66 S. Cooper, Memphis, TN 38104. St. Croix Festival Theatre New Doors Program will accept submissions for the fifth annual Festival Theatre One-Act Play Writing Contest from now through May 31, 2016. All playwrights with origins in, or ties to, the upper are invited to submit their unpublished and unproduced works. We strongly encourage all finalists to be present for the reading of their plays on August 10, 2016, so that they might join us in celebrating playwriting and great theatre in the nation’s heartland. Prizes will be awarded ($100 for first place, $50 for second place, $25 for third place). Eligibility: All playwrights with origins in, or ties to, the upper Midwest (Wisconsin, Minnesota, Michigan, Illinois, Iowa, Indiana, North and South Dakota, Nebraska) are invited to submit their unpublished and unproduced works. Run time 15-30m. No more than six characters. No musicals. Excessively “adult”, abusive or troubling language or stage direction may disqualify a play from consideration or subject the play to editing prior to reading or performance. Since 2000, MetLife Foundation and Repertorio Español joined forces to establish the MetLife Nuestras Voces National Playwriting Competition to discover the best Latino plays and bring them to the attention of the American theatre community. These original works relate to Latino culture, history, and life in the United States while at the same time reflecting the universality of the human condition. Eligibility: Playwrights may be Latino or of any other ethnic or racial background as long as the play’s subject matter and characters resonate with Latino audiences and accurately depicts the Hispanic experience.. New and un-produced plays preferred. Plays that have had readings or a workshop production are acceptable. Unproduced plays written in Spanish and/or English. No screenplays, one act plays, musicals, adaptations or translations will be accepted. Playwrights must be at least 18 years of age and residents of the U.S. or Puerto Rico. Playwrights interested in developing work with Bedlam may submit a synopsis and no more than 12 pages for consideration. Contact: Please submit electronically to Literary Manager Emily Lyons at literary@theatrebedlam.org with PLAYWRIGHT SUBMISSION in the subject line. Please do not submit complete manuscripts. Transfers by Lucy Thurber; The Wolves by Sarah DeLappe; Fury by Joanna Murray-Smith; Fingersmith by Alexa Junge. Pay: $622/wk. (Tier 9); $490/wk. (Tier 7); and $318/wk. (Tier 3). Equity SPT Contract. The Roar of The Greasepaint, The Smell of The Crowd (Santino Fontana, new words; Leslie Bricusse & Anthony Newley, words & music); Another Word for Beauty (José Rivera, book; Héctor Buitrago, music & lyrics); Head Over Heels (Jeff Whitty, writer; The Go-Go’s, music). Playwrights Horizons (NYC) seeks a full-time (year-round) Props Supervisor to manage the Props department for a 6-8 show season. The Props Supervisor works to build, buy and rent all of the props and set dressing needed for a given show. The Supervisor also maintains equipment and supplies for the Props Shop and storage spaces. Eligibility: Bachelor’s degree in Theater with an emphasis in Technical Theater or Design preferred. Three years or more working as a Props Supervisor (or equivalent), preferably in New York City. Symphony Space (NYC), a two-theatre, not-for-profit multi-disciplinary performing arts center, seeks an Institutional Giving Manager. Symphony Space produces or presents some 600 performances in music, film, literature, and children’s programs in its two intimate theatres, reaching 161,000 audience members per year. Eligibility: Minimum of two years’ experience with research and grant writing; skilled in relational fundraising databases (knowledge of Blackbaud’s Raisers Edge a plus), both data input and retrieval through canned and custom reporting; previous experience in a non-profit fundraising department. The Park Avenue Armory (NYC) seeks an experienced Technical Director to plan, oversee and be engaged on the implementation of the technical production of a wide range of interdisciplinary performances in the Wade Thompson Drill Hall as well as the Armory’s historic rooms from concept to load out. Eligibility: Bachelor’s degree in theatre production or similar. 10+ years of management experience in theatrical production of the performing arts or equivalent. Production and supervisor experience in New York City area strongly preferred. Eligibility: Artists or arts and humanities professionals aged 18 or older. Must be a legal DC resident for at least one year prior to the application deadline, maintain residency during the entire grant period, and have a permanent DC address. Artist Trust, a not-for-profit organization whose sole mission is to support and encourage individual artists in order to enrich community life in Washington State, will award grants of $1,500 each to sixty artists in the state working in any discipline. In addition, one artist will be awarded a residency at Centrum, a multidisciplinary arts center in Port Townsend, Washington, while one media or performance artist will be awarded an evening to show their work at the Neptune Theatre in Seattle (as part of the Seattle Theater Group Nights at the Neptune summer series). Eligibility: Individual generative artists and artist teams working in any creative discipline, 18 years of age or older, and residing in Washington State. Nearly 200 residencies and fellowships are now offered annually to creative professionals of all types, making Ragdale one of the largest interdisciplinary artists’ communities in the country. Each session, 13 artists-in-residence experience uninterrupted time for dedicated work on a 5-acre historic campus beside a beautiful 50-acre prairie, 30 miles north of Chicago. With live/work studios, all meals provided, and unmatched staff support, Ragdale lets artists focus on what’s most important: creating new work. Eligibility: Emerging as well as established artists representing the widest possible range of perspectives and demographics. While there are no publication, exhibition or performance requirements for application, applicants should be working at the professional level in their fields. Serenity. Light. Space. Privacy. The ability to work uninterrupted for hours, days, weeks in a quiet studio cradled in 400 acres of rolling Blue Ridge farmland. These are just a few of the reasons why more than 400 of the world's foremost writers, composers, and visual artists come to VCCA each year. Every residency includes a comfortable, private bedroom, three meals a day, and a private studio. The Mesa Refuge is located near the Pacific Ocean in Point Reyes Station, California, an hour north of San Francisco. Our residents are mostly focused on “ideas at the edge” of nature, human economy, and social equity. Here writers enjoy time and space to connect with their muses and a supportive community, before going back into the world. Eligibility: Experienced and emerging writers and creatives who are addressing the pressing issues of our time: nature, human economy, and social equity. Eligibility: Artists based anywhere in the world are eligible to apply as long as they can speak English and are not enrolled in a degree granting program at the time the residency would occur. Accepting artists at all stages in their careers working in all media, including, film, video, new media, installation, fiction and nonfiction writing, dance, music, and interdisciplinary.